The Colombo Plan Staff College (CPSC) family welcomed the newly-appointed Ambassador of Sri Lanka to Manila who is also the newest member of the Governing Board, His Excellency, S.V.D. Gamini Samaranayake, at a special ceremony held in the College on September 23, 2014. The ambassador was accompanied by H.M.G.R.R.K. Wijeratne Mendis, Charge d’ Affaires of Embassy of Sri Lanka. Dr. Mohammad Naim Yaakub, CPSC Director General, expressed his sincere welcome to the ambassador in his opening remarks. He cited the relevant cooperation between CPSC and the Government of Sri Lanka in addressing the pressing needs of TVET in the country and in the region as well. Dr. Naim also looks forward to a close working relationship with the new ambassador in fulfilling the mandate of CPSC to its member countries. He also briefed the new ambassador about CPSC’s close cooperation with Sri Lanka through various programs and services provided for the country for the past years. In his response, H.E. Samaranayake expressed his interest to learn more about CPSC’s activities and goals to better serve his role as member of the Governing Board and representative of his country to CPSC. He mentioned the different strengths of Sri Lankan educational system and the areas which need some attentions, one of which is strengthening the country’s TVET systems as a pathway for gainful employment. He also conveyed his appreciation to the warm welcome accorded to him by the college which enticed him to closely work with CPSC in addressing the relevant concerns of TVET in the region. His Excellency took up his Ph.D. in International Relations from 1986 to 1991 at the University of St. Andrews, while his M.A. in Political Science (1981 – 1983) and B.A. in Political Science (2nd class upper, 1967-1968 and 1973–1976) both from the University of Peradeniya, Sri Lanka. As an academic, His Excellency rose from Assistant Lecturer in 1977 to Senior Professor and Chair of the Department of Political Science at the University of Peredeniya. He also held administrative positions as Vice Chancellor of the University of Rajarata and has participated in numerous international conferences, workshops, and fellowship programs. 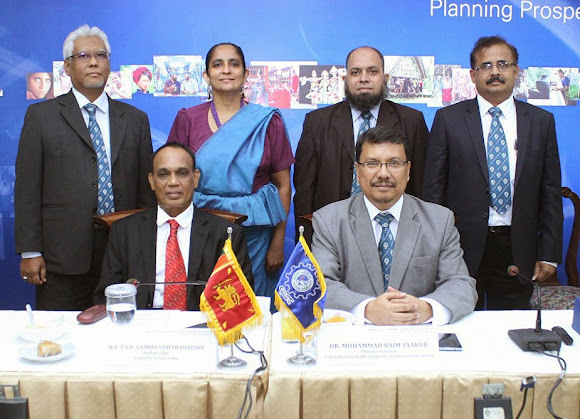 Sri Lanka has been a very active member of the college since 1973 and has continuously worked side by side with the college on the mutual advocacy for human resources development through capacity building efforts such as various CPSC regional, in-country, customized programs for its pool of professional staff. As of this year, CPSC is represented in the country through the Department of Technical Education and Training (DTET) led by its current Director General, Mr. J.A Ranjith.